Anyone who has a reason to read an action-packed prose story to excitable young kids should pick up Sock Monkey in the Deep Woods. This delightful adventure tale, written by animator Matt Danner, is full of bold exciting events and delightfully detailed spot illustrations by the always wonderful Tony Millionaire. As you might imagine, this is a story of Millionaire’s Sock Monkey Uncle Gabby and his friends the button-eyed Mr. Crow and doll friend inches as they encounter terrifying amarok (“a large hairy wolf-like creature with huge gnashing teeth and glowing eyes”, as we’re informed, as well as drooling caterpillars; a civilization of bears with zeppelins and a corpulent queen; a hungry sea serpent and angry-looking submarine; a Trumbernick in the woods, and a group of harpies. 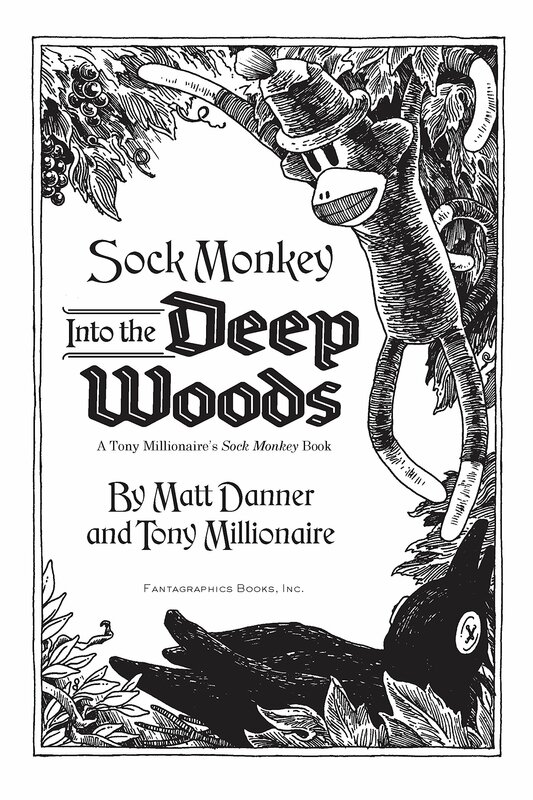 It’s one dynamic adventure after the next, all thrilling hijinks and delightful design, as Millionaire and Danner take their characters through a thrilling story that reads like a long-lost early twentieth-century kids novel full of danger, excitement, exotic creatures and steadfast heroes. It’s tremendous fun for all ages, with about two dozen wonderful illustrations by Millionaire to keep your kids grounded in reality as they read this imaginative, delightful tale. Young children will love this adventure into the Deep Woods. I wouldn’t be surprised if I see a few kids next year dressed as Sock Monkey for Halloween.